The Guiding Coalition is a group of diverse people with a keen interest in the relationship between governance and public engagement. The Coalition will report to Administration regularly, and to City Council twice a year. An Administrative Co-Chair and a Public Co-Chair. Maximum 10 City of Edmonton staff with involvement or interest in the implementation of the Council Initiative on Public Engagement and/or public engagement processes and activities. Minimum 10 members of the public who represent the diversity of the City of Edmonton. Adjunct Members representing the Engagement Branch, Director level or higher. Select Council Members who will not be members of the Coalition but who will act as liaisons with City Council. A Coalition Coordinator representing the Engagement Branch, Manager level or higher. A maximum of 20 members in total. Including the two co-chairs but not including adjunct members, the Coalition Coordinator or Council liaisons. Recruitment of Members is done by Members, in accordance with the Guiding Coalition Recruitment Process which includes, but is not limited to, an application, interview and vetting process. Terms are 2 years in length, and begin in September. Sub-committees of the Coalition may be created at the discretion of the Co-chairs in consultation with the members for the purposes of carrying out the Coalition’s mandate, implementing the work plan, and completing deliverables. Sub-committee members may be drawn from the membership of the Coalition, other City staff members or members of the general public. 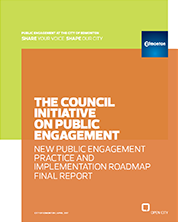 This report sets a new course for public engagement through leading practice and describes how it aligns with the City’s strategic direction, Public Engagement Policy, Procedure and Framework.